A ‘Business Ready Brain’: What is it and how do I get one? There is a perception that university can only prepare you with the theory behind the job you do. Employers are increasingly finding that graduates are lacking the skills they require to maintain a role within their organisations. So, what are we going to do about it? What opportunities are there to apply theory to practice and put ourselves to the test? The Alliance for YOUth aims to bridge the gap between the skills graduates are traditionally equipped with when leaving university and what organisations actually expect from their employees. 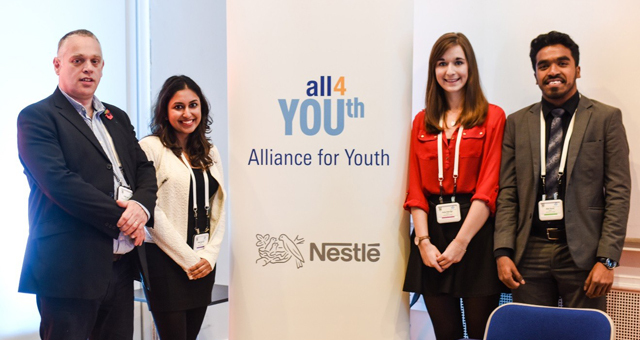 Over 200 companies have joined Nestle, along with many schools and universities, including the University of Surrey, to provide an ‘employability toolkit’ to thousands of young people, equipping them with the skills they need to succeed. Friday 6 November 2015 saw the launch of this toolkit, sponsored and hosted right here at Surrey Business School. It invited representatives from the organisations involved in the alliance, young people from these companies, as well as students from the university itself. Those who attended were treated to an overview of the toolkit, which covers areas such as how to find a job, managing your digital footprint and the CV and interview process. Later in the day saw interactive discussions with the alliance organisations which included what they expect from graduates and potential employees and their tips for gaining employment. 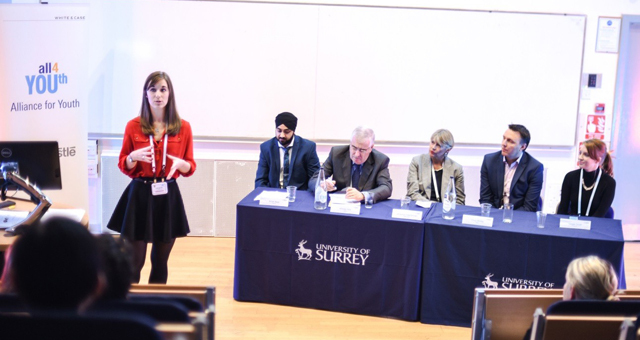 Having had the opportunity to ‘pilot’ the toolkit as part of my Business Management BSc programme at Surrey, I was lucky enough to be one of the students invited to present at the launch and talk to the audience about my experience. This was incredibly scary (especially knowing who was in the audience) but was also hugely rewarding. The day provided me with so many networking opportunities in which I could gain some valuable contacts in some of the biggest organisations in Europe, whilst finding out what activities they are involved in and what opportunities there are for undergraduates like me, both during placement year and beyond university. I think how I presented myself on the day, both during my presentation and during these networking opportunities, is testament to what I have learnt during the past year and a half at Surrey Business School, as well as to the toolkit, which provided me with further skills in interacting in a professional manner. Is Surrey Business School providing me with the theoretical knowledge to understand business? Yes. Is it also providing me with the skills and ability to successfully apply and adapt this knowledge to real world situations? Absolutely! I honestly feel as though Surrey Business School is giving me the best possible chance of landing a great job- both for my placement year and as a graduate. Surrey’s involvement with great initiatives such as Alliance for YOUth are an invaluable part of this process. Building a ‘business ready brain’ is not easy but it is a key part of the culture here at Surrey – making the most of the opportunities around me and stepping out of my comfort zone can only be a good thing! A guest blog by Katie Aldridge, BSc Business Management, Surrey Business School. From little desk tidies mighty online platforms grow!